It was attached to the hood of my truck, on the driver’s side, and hanging on for dear life. I’m not sure when it arrived at that spot but because it was soon to depart I pulled into a parking place and rushed out to get a few pictures before the thing was swept away. The temperature was already soaring into the 80’s and the wind was gusting hard. Each blow caught the wings and laid the delicate creature on its side. Yet, it held onto the slick surface as if glued. Oh, I forgot to mention that the “it” was an unfamiliar butterfly of small stature displaying some fascinating underwing décor. 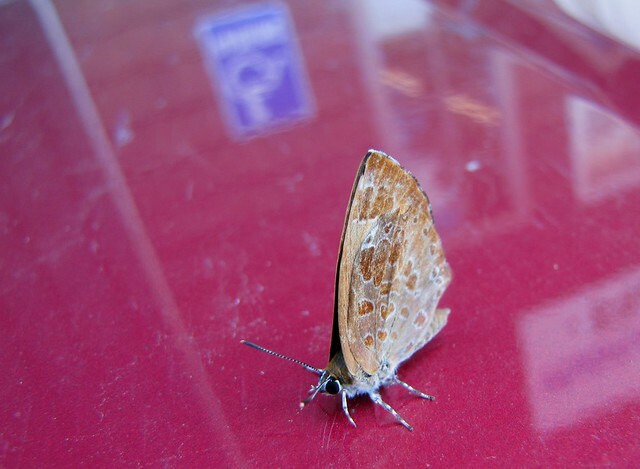 I leaned awkwardly over the hood and attempted to capture a portrait of the butterfly as best I could. A pair of folks entering the nearby store looked over just long enough to make sure that I wasn’t having some sort of seizure there on the car hood. They could not have seen the tiny subject before my lens. Detecting no drool from my tortured frame, they probably chose to leave me to my own. Fortunately they did not ask what I was doing. I would have been forced to tell them I didn’t know the exact identity of the insect I was so earnestly examining. Afterward I pegged the creature as a Harvester Butterfly – or, as it is often written: “The Harvester” (as in THE Ohio State University”). Harvesters are not your run of mill flower-sucking butterflies. Harvesters are carnivorous. Well, to be precise, their larvae are the predatory ones. 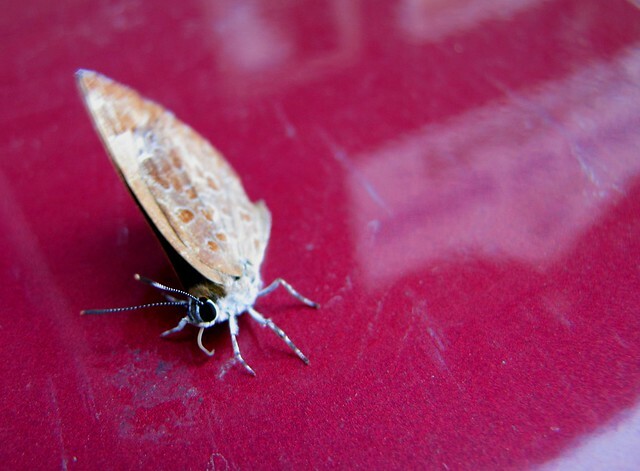 They are the ONLY predatory butterfly or moth larvae in North America – a single species within a single genus. Considering that every other God-fearing caterpillar on the continent is a strict vegetarian, this represents quite a departure from the norm. The chosen Big Mac for Harvester larvae are rather unappetizing looking creatures called Wooly Aphids (Woolly Maple, Alder, and Beech Aphids). Harvester caterpillars live amongst the slow moving woollies and eat them at their leisure. Four sharp teeth on their mandibles facilitate their predatory pursuits. The larvae sometimes decorate their bodies with the hollow corpses of their victims and because they exude aphid odor they are unmolested by the ants that often tend the aphid colonies. I’m not sure there is a lesson here for you vegetarians out there, but meat-eating Harvester larvae grow much quicker than their vegetarian cousins. Instead of the usual 5 stages, or instars, they complete their growth with only 4 instar stages and do it in as little as 8 days. Their final shedding produces a pupa which looks like a monkey face mask. Odd? Yes, they are. 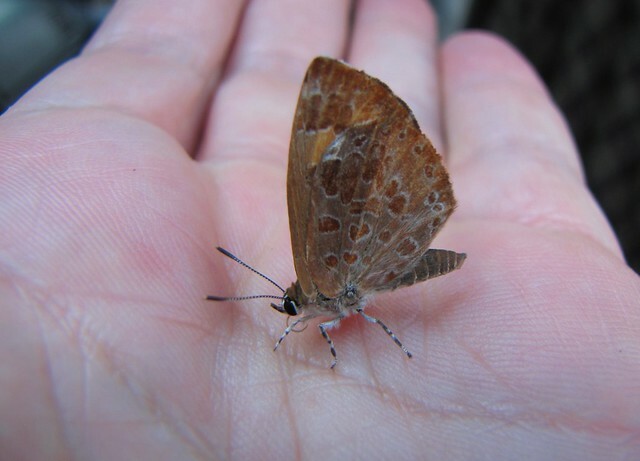 The adult Harvesters, in spite of their bloody childhood, look like normal butterflies. The underside of the wings is delicately speckled with burnt sienna spots outlined with cream borders. I wasn’t able to convince my semi-captive butterfly to reveal the upper side of its wings. In fact, when I tried to pry them open it took great exception to my intrusion and flew off. As a matter of record, they were deep orange with a broad black border pattern. The only thing that defines the adult insects as “being different” from other butterflies is the presence of a very short tongue or proboscis. 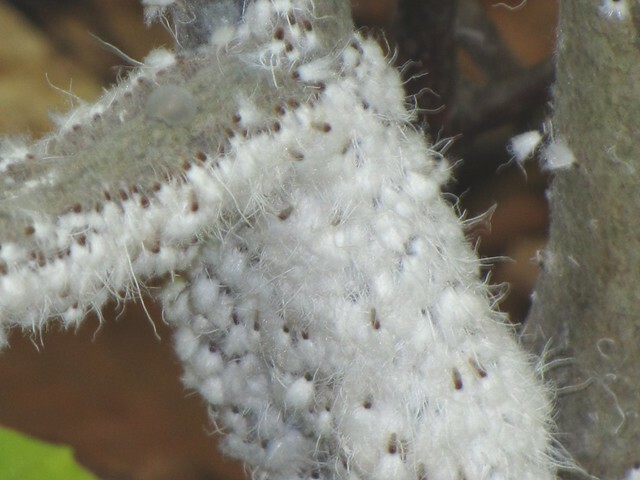 Harvesters abandon their predatory ways and resort to sucking nutrients from sap, mud, carcasses, and – no surprise here- aphid honey dew (aphid doo). This short tongue is an adaptation towards this goal. Flower-feeding butterflies require long tongues for probing flowers. Licking doo from the rear end of an aphid only requires a short straw. In looking over my photos after my Harvester encounter, I did notice that I was apparently parking in the Handicap spot at the store. Take a good look at the photo and you’ll see the blue sign clearly reflected on the hood of my truck. Ah, so that’s why those people were looking at me so oddly! There are two definitions of the word Bluet. 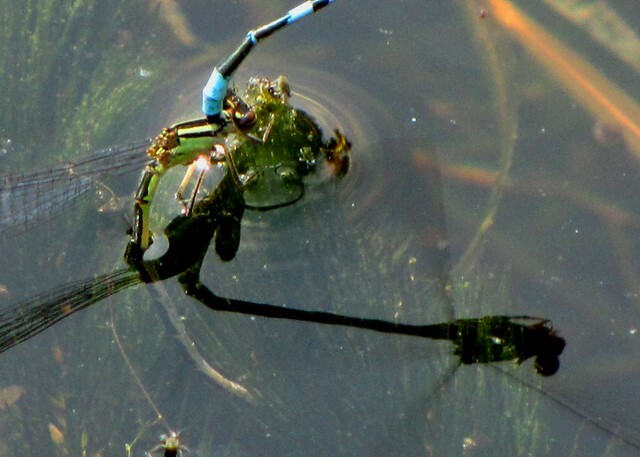 One refers to failure – as in “I had my chance but I…” – the other refers to a group of slender Damselflies. Although I am an expert in the former, I will be talking about the latter in this blog since this is a nature themed endeavor. Dwelling on failure would be a way for me to “bluet” in terms of this writing forum. No, I’d rather talk success and this is where the Damsels come in. 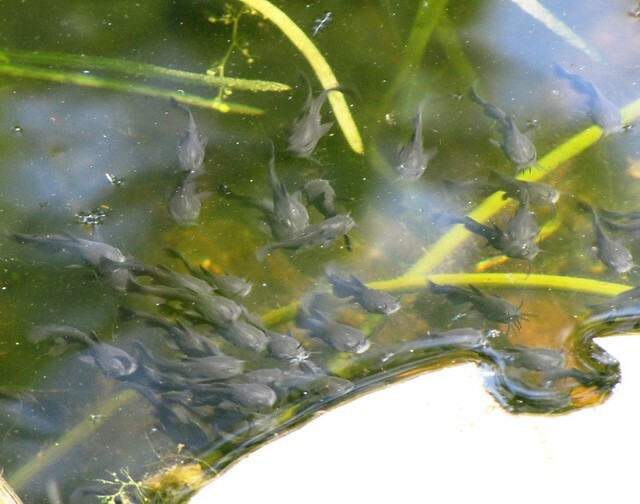 This is the height of their breeding season and the sight of successfully bred Bluets is beautiful. A walk down to the lake this time of year always yields dozens of Familiar Bluets. These insects are not just familiar in terms of presence, but they are actually called Familiar Bluets (Enallagma civilie – let’s all say it: En-all-ag-ma siv-il-ee). One could be un-familiar with Familiar Bluets, so as not to be accused of blueing it let me state that these insects are members of the Damselfly clan. Closely related to Dragonflies, damsels are typified by a fragile frame, widely spaced eyes, two pairs of wings which are narrow at the base and widely spaced…wait a minute, I already said that one. 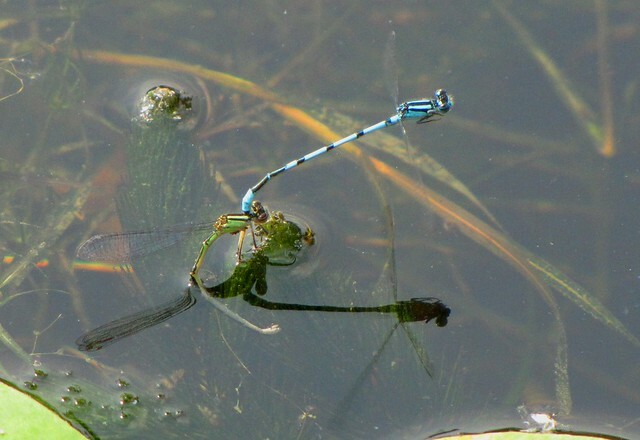 Anyway, within the Damsels there are those called Pond Damselflies that hang around still bodies of water and rest with their wings folded parallel to their bodies. Bluets are Pond Damselflies. There are many kinds of Bluets and all the males are small and predominantly blue – thus the name and a potential source of much confusion. The females are not blue – they are green or pale tan. What about the ladies you ask? Isn’t naming a species group after a male trait rather sexist? Frankly yes it is, but since Greenlet or Tanlet were never proposed you’ll have to let it go. Remember, however, that members of this order are all called Damselflies and not Guyflies. If you will indulge me for one more layer of trivial information, male Familiar Bluets are identified by having solid blue 8th & 9th abdomen segments and a mostly black 7th segment preceding it. All this segmentation banter brings us to the final segment on the male Bluets’ little blue body which is equipped with a set of handy claspers. Successful breeding, in terms of Damselfly life, depends heavily upon these devices. 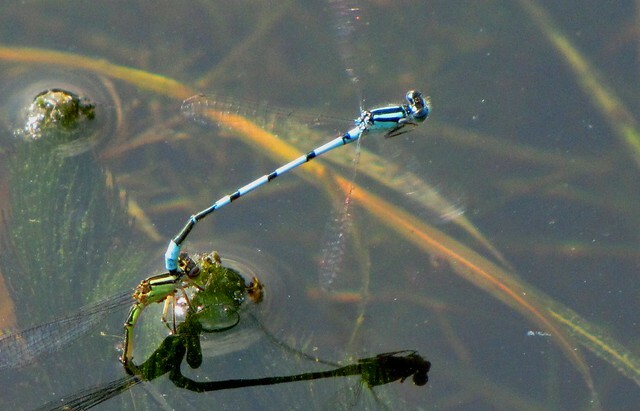 I will not get into the details of the reproductive process, but it involves a male Bluet grabbing a female Tanlet by her neck using his claspers. Held thusly, the female curls the tip of her abdomen up to the male in order to mate. Once this is accomplished the male does not release his mate but instead accompanies her on her subsequent egg-laying foray. I have pictures of this egg-laying portion of the process to show you. It looks awkward, but there is method in this madness as far as the male is concerned. The freshly mated Damselfly tandem make for the weedy shallows and seek a perching place where the aquatic vegetation pokes above the surface. The female “perches” while the attached male hovers to stay in position. She lowers her abdomen into the water (often submerging completely) and inserts tiny oval eggs into the soft tissue of the water plant. The terminus of her abdomen is equipped with a knife-like ovipositor for performing this feat as she blindly feels her way along the stem. Let’s not anthropomorphize this act any further lest we get into a feminine rights issue. The act of clasping and guarding is simply a part of Bluets being Bluets and nothing more. 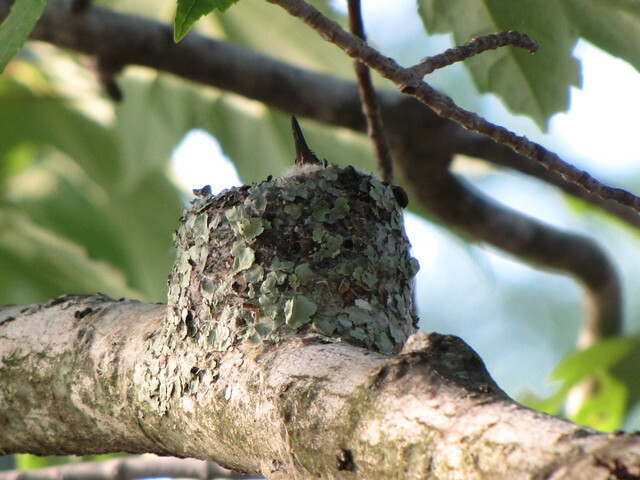 When I last posted about our Dollar Lake Hummingbird the little verdant queen was just beginning the long process of egg-sitting (See “Nest in a Nutshell”). 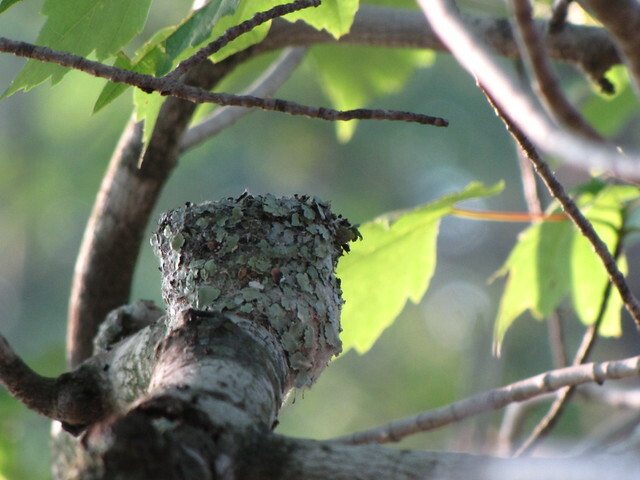 It was the end of May and the next step following a prolonged week of nest construction. I opted to track her progress over the course of the next month and bring the story to its natural conclusion. This posting takes form as more of a photo essay – as opposed to a detailed journal of events – because of the sheer wealth of pictures I was able to snap. Thanks to the aide of an improvised mirror taped to a boat oar and the ability to stand on my shed roof, I was able to gain a number of perspectives on the situation. 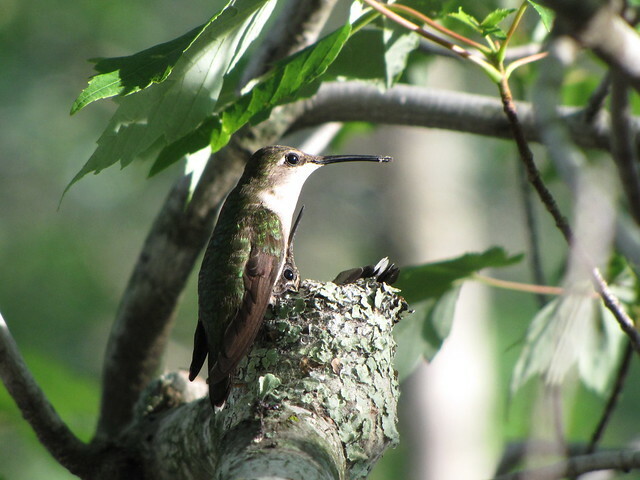 The female Hummer was amazingly patient during the process and she “allowed” me close approach without undo anxiety on her part. The same cannot be said for the local bird population. 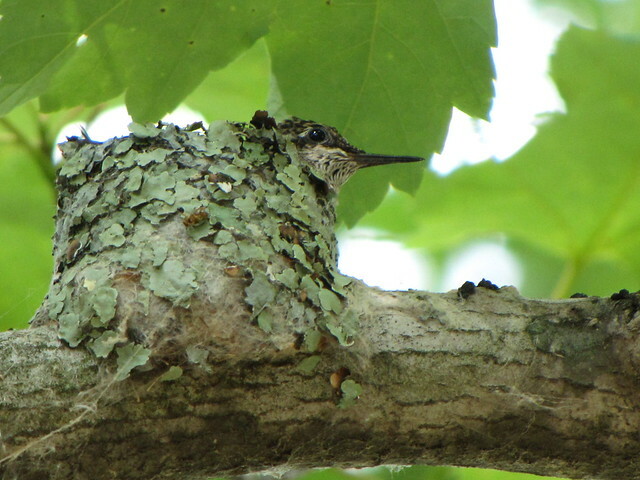 Any bird approaching within a few dozen feet of the nest was dive-bombed. She harassed a Water Thrush, several Robins, and a confused looking Rose-breasted Grosbeak over the course of my sporadic observations. 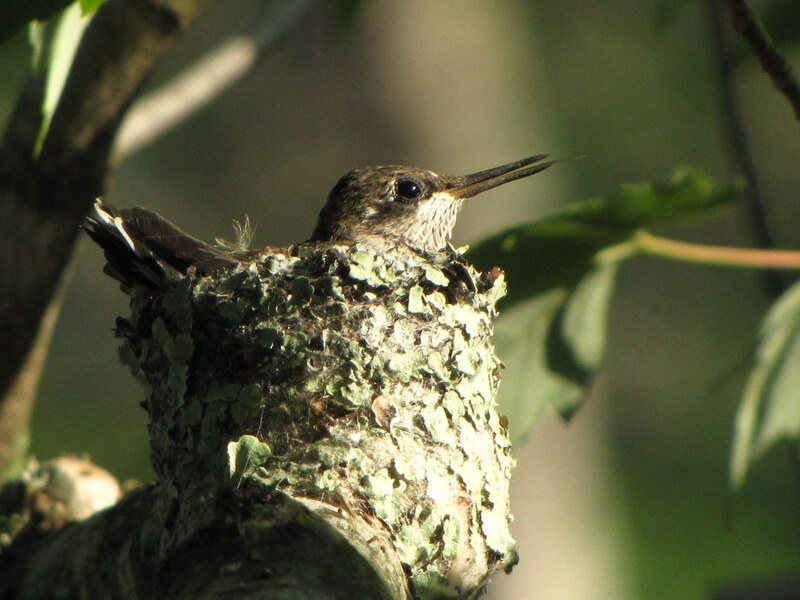 Her incubation period consisted of short episodes of brooding and frequent trips away from the nest to feed and preen. A mirror check during one of her forays, some 21 days after the first signs of incubation, revealed a naked chick lying next to an un-hatched egg. The hatchling cradled its fellow egg with a wing stub as if to comfort its future nest mate. The second egg remained un-hatched, however, and it was eventually crushed and removed. This single chick would have full possession of the space and the full attention of the female for the next few weeks. 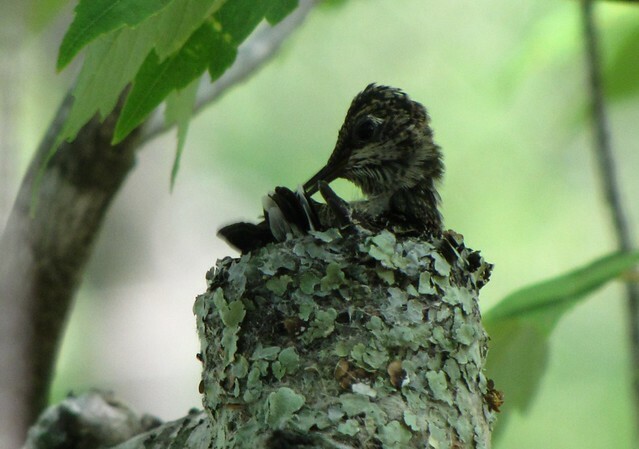 From the moment of hatching the parent bird began a strict regimen of feeding and foraging. When the chick was very small (small being a relative term for such a miniscule bird!) the female added brooding periods to her schedule and she was sitting on her charge as nightfall each evening. 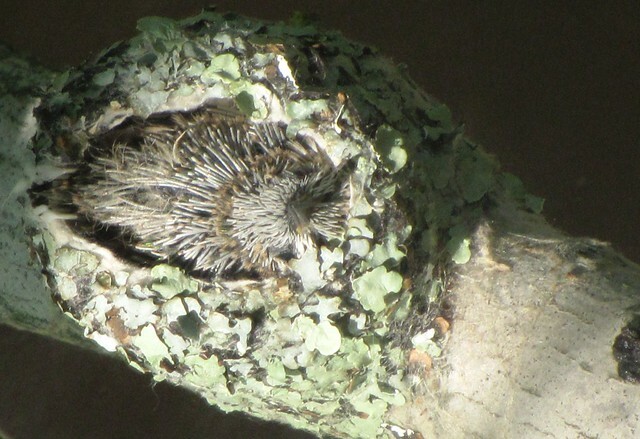 Within a week, the wide-eyed chick nearly filled the nest cavity and was covered with a layer of pin feathers. There being little extra room, the birdlet would sit with its neck bent upward and the beak pointing strait up. The female was no longer brooding her young at this stage ( I think the nestling’s vertically pointing beak having something to do with it!) but was devoted to a twenty minute feeding and foraging routine. Feeding events were short and never lasted more than 15 seconds or so. 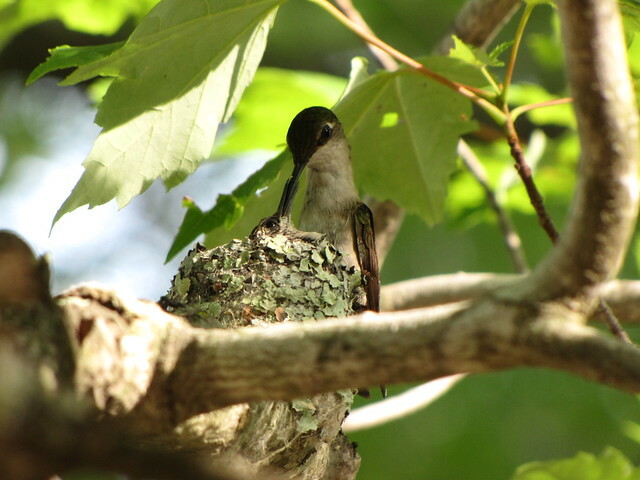 She clung to the edge of the nest while inserting her bill into the begging mouth of the chick and pumping a pre-digested mix of insects and nectar directly into its gapping maw. 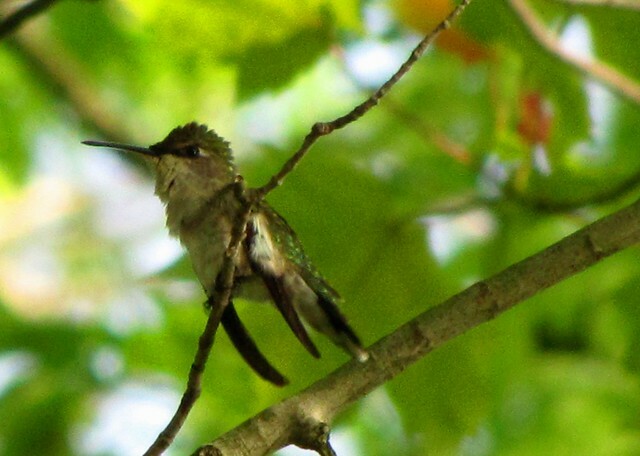 The uncomfortable angle required the female to extend her neck to an “unhummingbird-like” length in order to get the tip of her beak into proper position. 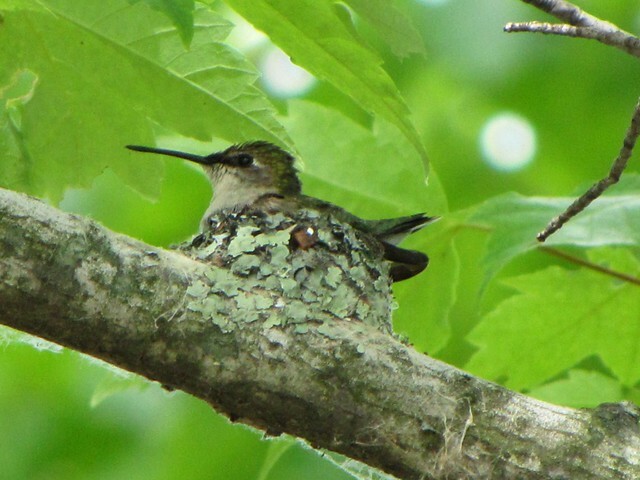 As of July 4, and some 12 days after hatching, the nestling sported a full covering of green-tinted feathers mimicking the plumage of its mother. A full set of wing feathers made for a difficult fit into the nest and the place was getting tight. 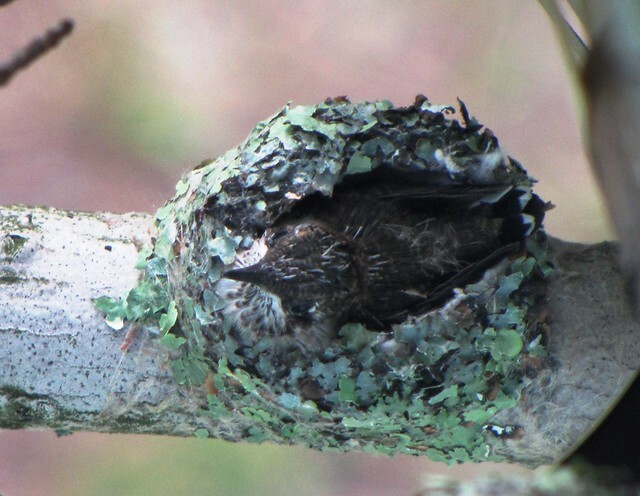 Hummingbird nests are flexible by design and are built to conform to the growing young like a body sock (imagine the normal contingent of two young in such a structure). The chick was constantly wiggling and turning about (see movie) as the days progressed – spending time preening, peering over the edge, or picking away at flyby insects (a particular blue damselfly was a special temptation). Confined as it was in a tight bag, the young bird instinctively maintained sanitary conditions by periodically waddling it’s posterior over the edge of the nest and forcibly ejecting a stream of dropping into the void. The time was fast approaching when the bird would itself launch into that void. Bouts of wing stretching evolved into extended stationary flight exercises in preparation for that very moment. 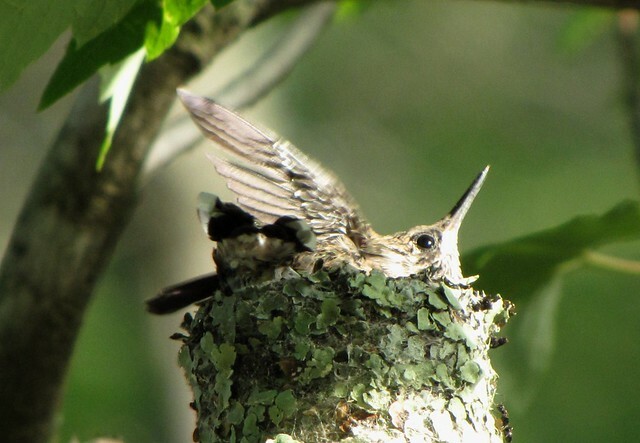 On the morning of July 6, the nestling was beating its appendages so vigorously that it nearly lifted itself out of the nest and the effort tired the little bird out so much that it settled back deep into its cup for a long rest. I did not witness the actual departure, but I know that the bird left the nest sometime over the course of the 6th. 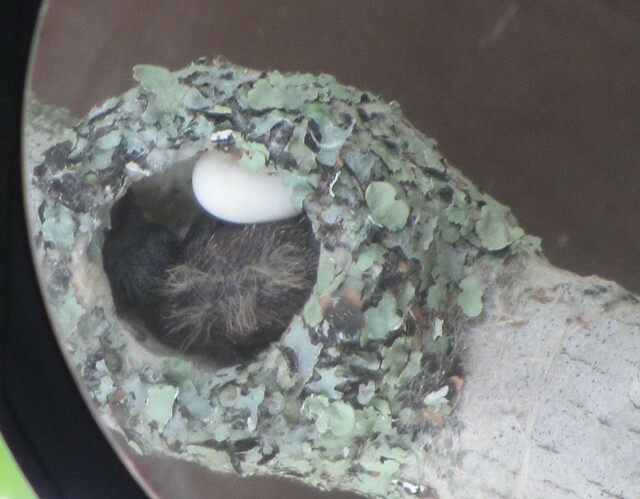 The nest was empty as of 8 pm that evening and 14 days after the egg hatched. My involvement with the hummingbirds ended on that day. I spotted the shadowy form of the female several times as it hovered around the spruce tree located just beyond the shed roof and 50 feet from the nest. 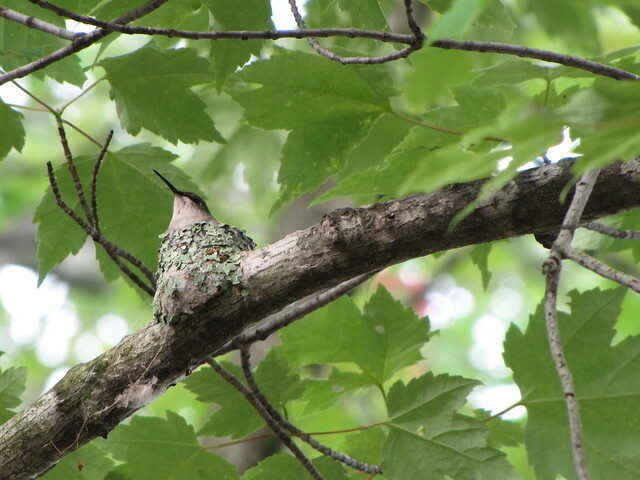 I suspect the young hummer’s first flight took it over to the protection of the evergreens and well away from my prying eyes. 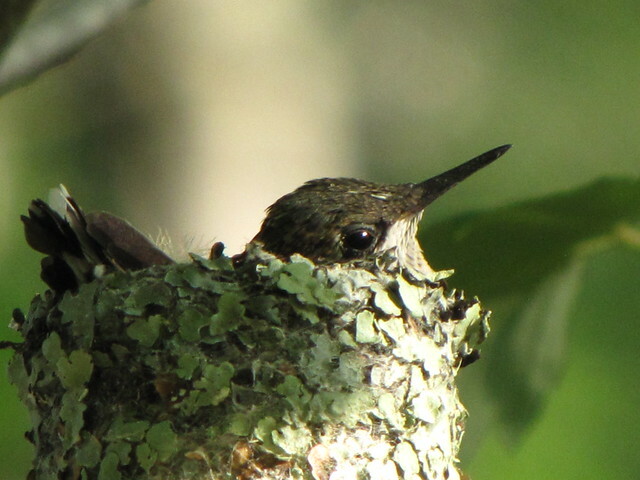 There some things I will probably never know about this situation – for instance whether the nestling- turned -fledgling was female or male, or why one of the eggs did not hatch – but being witness to a few weeks a hummingbird life was a fascinating glimpse into one of nature’s little lives. 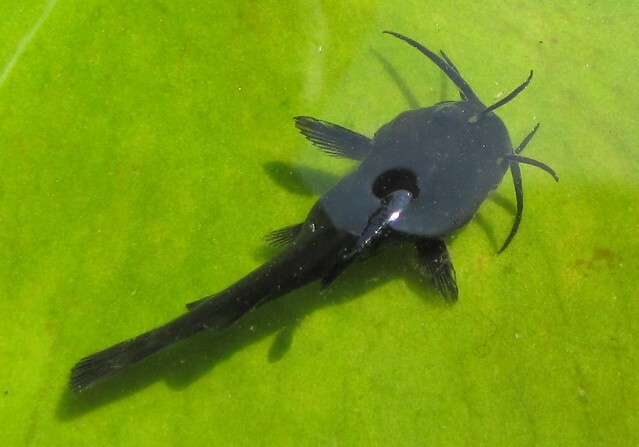 My wife and I can attest to the multitude of Black Bullheads in Dollar Lake. They are about the only fish we can catch and the reason why we’ve given up trying as of late. So, it is no wonder that great bunches of their offspring should start appearing in early summer. They congregate in the warm shallows beneath the water lilies and roll about between the cat-tail stems. 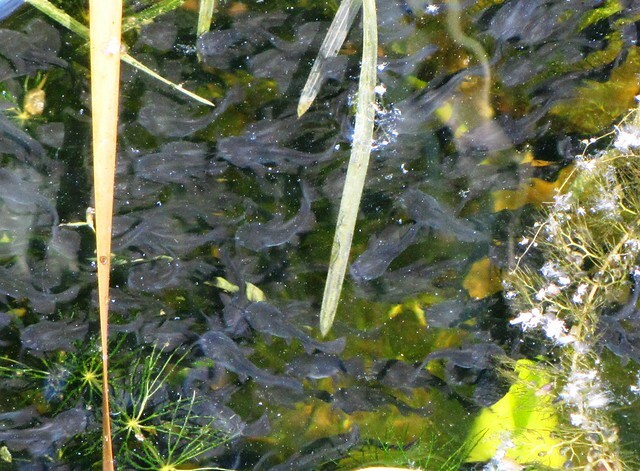 Roll is an appropriate word when applied to young bullheads because they stay together in a ball-like cluster for some time. 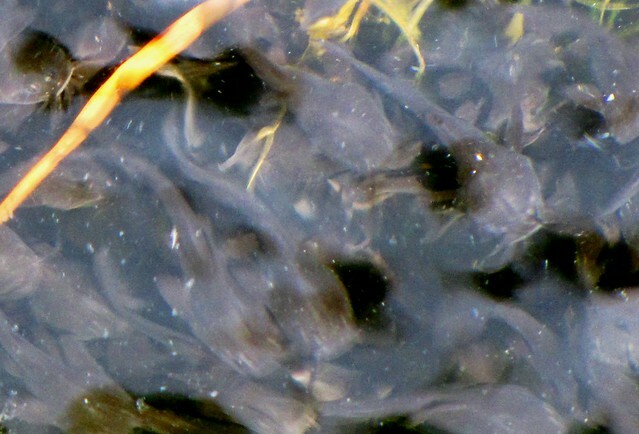 The fishlets stay so close that they move as one organism as they feed. There were two such bullhead balls off the dock the other day. The process of making a bullhead cluster began earlier in the spring when a pair of bullheads linked up and decided to have some little bullies. The female laid a gelatinous glob of eggs (containing ten thousand or so bullhead seeds) which the male dutifully fertilized. She attended to her brood for a day before turning the whole affair over to the male (in other words she went to the mall and never returned). The male Bull ventilated the glob with a beating motion of his fins until they hatched out. Normally this would be the point where the little ones scatter and get eaten by all the other big bad fish in the lake. But, in this case the male continued to guard his clutch like a whiskered mother hen. He watched over them until his charges put on some size and bravely abandoned them at the point where they started to look edible. Given this type of head start, you’d think the baby bullheads would get the idea that it was time to venture forth on their own. Instead, they continue to stick together and pretend that dad is still hovering about. Feeding on micro crustaceans they mill about in a continually morphing ball of hungry little mouths and gobble up all in their path. The fish hovering beneath the surface at dockside were at this post parental stage. It became my mission to get a detailed look at one of the them. It was like looking inside a bag of potato chips to make out the outline of an individual chip, however. So, crouched into heron position, I waited for them to get within reach. The moment came and went several times before I launched a grasping hand with middle-aged swiftness and missed. Or so I thought. One of the fry became stranded on top of a lily pad in the confusion and I celebrated the catching of yet another bullhead from Dollar Lake. 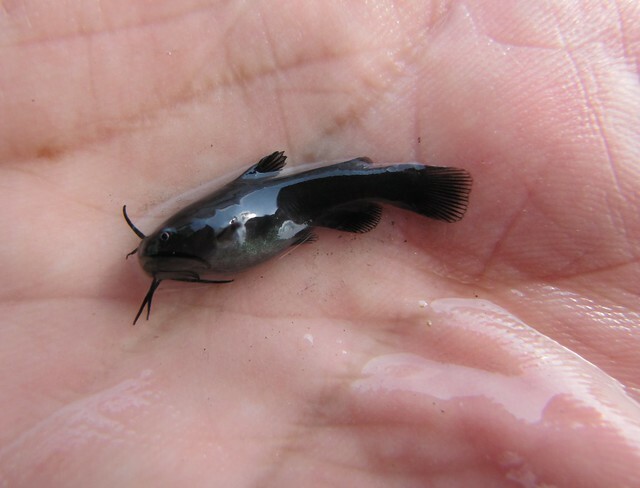 Perfect in every detail, the baby bullhead looked a shrinky-dink version of an adult. It was barely an inch long and dully equipped with stubby sensory whiskers. The dorsal and pectoral fin spines – things to be avoided on large bullhead – were large by proportion on this small frame. Such structures, along with a pair of spines on the gill covers, make even micro bullheads hard to swallow and it is obvious that nature wastes no time in getting these defensive weapons ready for service. The fish was fat and the silvery distension of the belly provided proof that it was thriving on a diet of micro invertebrates. Because I could not keep any water in my palm, I quickly threw the gasping fish back into the drink to join his ball’o bullhead brothers and sisters. Soon it will separate from his siblings and grow into an independent creature. When next I see the thing it will be up to his whiskers on my hook and I will not be nearly as pleased as the first time we locked eyes.